Please join me in congratulating the Mock Trial Team for their success at the Regional Mock Trial Tournament in D.C. this past weekend. The Team finished with a 4-4 win/loss record, which included 3 wins over Gettysburg College. Competing team members were George Bruner, Zachary Jacobson, Kathleen Kennedy (co-captain), Nicole Miller, Michael Sorrentino, Adam Spacht (co-captain), and Tim Woods. The Team is especially proud of Zachary Jacobson who won awards for Outstanding Witness and Outstanding Attorney. Over 120 students competed in the Regionals this year; individual awards are given to the 10 best witnesses and attorneys in the competition. Zach was the only student to win both awards, an especially impressive accomplishment given that he is a freshman in a relatively new mock trial program. Students who are interested in competing on the Mock Trial Team next year are encouraged to begin attending our Thursday afternoon meetings now, as we continue to work on learning the Federal Rules of Evidence. In just its third year at the Mount, the Mock Trial team has greatly expanded its scope and has begun to tackle competition across the eastern coast. 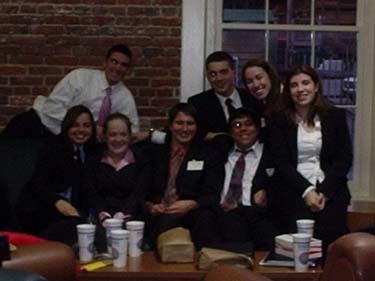 From November 16-19th, the team roadtripped to Charleston, South Carolina to compete in an Invitational with rounds held both in actual courtrooms as well as in the Law School for the College of Charleston. The team competed against 3 teams from the University of Georgia and a team from the University of North Carolina. Additionally, this past weekend the team traveled to Elizabethtown College for a scrimmage in which it competed against the teams from Dickinson College and Elizabethtown. Junior and Team Co-Captain Kathleen Kennedy said, �Last year, we pulled the whole thing together last minute and went in fighting the best that we could. This year I think we are wiser and more prepared. We have become a really great group of friends and I think that has helped us a lot. Instead of just getting a great experience we are having a lot of fun along the way.� As a team, we know how to work together in and out of the courtroom. �One neat thing about the Mock Trial Team is a strong sense of unity. It is fun to attend their meetings, where each member feels comfortable to contribute, argue a point, or make a mistake. Marcia McKinley and the students have organized a major success at our school,� said Dr. Michael Barry, Assistant Professor of Economics and Co-Advisor to the Mock Trial team with Dr. Marcia McKinley. However, Mock Trial is not entirely based on law. It is equally important to have strong communication and acting skills, as style is a major factor of the competition. �I enjoy practicing the art of persuasion, honing my acting skills, sharpening my reasoning skills, and working on my argumentative skills; all while wearing a snazzy suit and pretending to be a real attorney,� said Freshman Zach Jacobson. Additionally, Mock Trial competitions are great opportunities for actors to try out several different roles. In this year�s case, possible witness roles included a Police Chief, a Convicted Gang Member, a CSI, a Radio Talk Show host, and many others. �Personally, I participate in Mock Trial so that I can play interesting characters,� said Junior Tim Woods. �Being in mock trial allows me to have an incredible amount of fun, while forcing me to be quick on my feet and think fast,� said Junior Branda Reynolds. Mock Trial can be taken as either a club or for credit towards the Legal Studies Minor and Sociology. Students who would like more information about the Mock Trial team should contact Dr. McKinley at mckinley@msmary.edu, co-captain Kathleen Kennedy at KEKennedy@email.msmary.edu, or co-captain Adam Spacht at AMSpacht@email.msmary.edu.